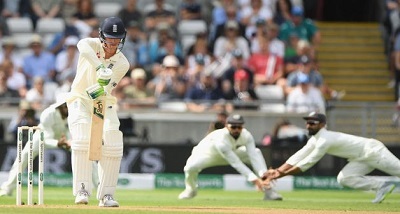 In cricket, chasing England's first innings score of 287 in the opening Test at Edgbaston, Birmingham, on the second today, India were 76 for 3 at lunch. Mohammed Shami claimed the wicket of Sam Curran. For India, Ravi Chandran Ashwin bagged 4 wickets, Mohammed Shami 3 while Ishant Sharma and Umesh Yadav shared one wicket each.